Adams Carpet Care offers full service, residential and commercial carpet cleaning in Chapel Hill NC. We have proudly served the Chapel Hill area since 1985. 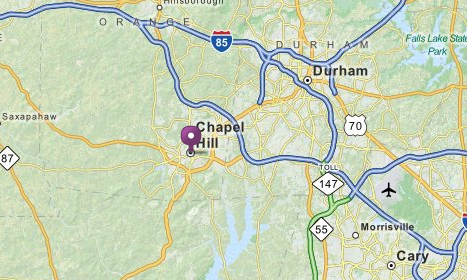 Our Chapel Hill carpet cleaning services have been found by homeowners and businesses, alike, to be above and beyond the competition. Adams runs a truck-mounted steam extraction cleaning process that can get the toughest dirt and grime out of your carpets, area rugs, oriental rugs, upholstery, tile & grout. Chapel Hill, named #10, Best Places to Live by Money Magazine in August 2012, is a unique town, consisting of a downtown area, university, residential & business districts, hospital and more. We serve the zip codes of 27514, 27515, 27516, 27517 and 27599. Our Chapel Hill carpet cleaning services are offered in Meadowmont, Timberlyne, Estes Drive area, within the Downtown walking district, Airport Road, Ephesus Road, Southern Village and more.